After You by Julie Buxbaum is the kind of novel you get lost in, where partway through, you feel like the characters are friends and you live as much in their fictional world as in your own real world. Of course, it probably helped that I read it during a sick week when I desperately wanted to escape my own miserable life, but I think credit belongs to Buxbaum’s writing. I wonder now how many times Lucy sat in this exact spot, on Sophie’s bed, with the weight of Sophie’s head against her shoulder. If she, too, felt that sharing her favorite book was the purest way to express love, like telling your secrets or saying a prayer out loud. Sophie moves in a little closer, looks up at me, her expression impenetrable. I’ve dropped my kid tone, because I think I’ve been underselling her. I’ve noticed that she holds books with the same reverence as I do, taking a breath before she opens the cover, sitting still for a moment when she closes one. The way she gets lost in Nancy Drew, lets herself to be carried off to one girl’s adventures in Indiana, tells me she has a much richer inner life than I’ve been giving her credit for. Sophie is devastated by her mother’s sudden death, but Ellie begins to make some progress with her, and her support is essential since Sophie’s dad seems lost in his own grief. Things aren’t always what they seem, though. As Ellie struggles with her own husband, who’s back home in Boston, she discovers secrets about her best friend Lucy that she never suspected. Ellie begins to feel that her whole life is unraveling and nothing is as simple as it seems. This book tackles the complexities of marriage, friendship, and grief, but it is also about the healing power of books in general and a love song to The Secret Garden in particular. I came to really care about Ellie and Sophie and was rooting for both of them to work out their problems and find happiness again. It was a warm and compelling story, right to the last page, and I think I'm way overdue for a reread of The Secret Garden. October 26? Huh? Where am I? After more than three weeks spent sick and lying on the couch, I feel a bit like Rip Van Winkle this morning. But, I am up! It's been more than 24 hours now, so I'm hoping this trend of feeling OK continues. Just in time - my husband caught the virus our sons had last week. I finished The Circle of Gold by Guillaume Prevost, last book in the middle-grade/teen The Book of Time trilogy - very exciting conclusion! I started The Heretic's Daughter by Kathleen Kent, about the Salem witch trials, for one of my book groups. It is haunting, horrifying, and compelling (and based on a true story). I'm glad I wasn't around in 1692! I'm still listening to Hush, Hush by Becca Fitzpatrick - didn't get very far with it last week because both of my kids were home sick, too, but I have a long car ride this week, so I should finish it. If you're interested in the kids' and teen books our family is reading, check out Great Books for Kids and Teens. Book reviews to come this week - hurray! Another tough week with both of my sons sick as well, but I do think I am finally, gradually gaining some energy back. I even drafted a book review yesterday, though I was too worn out to finish it and post it. I'm hoping for life to return to some degree of normalcy next week. In the face of all this mythology [of the perfect mother] it becomes difficult to admit that occasionally you lock yourself in the bathroom just to be alone...The great motherhood friendships are the ones in which two women can admit this quietly to each other, over cups of tea at a table sticky with spilled apple juice and littered with markers without tops. Now I know that much of parenthood is watching and waiting for the chick to fall into harm's way, watching and waiting for the cats and the cold nights. The joyous enterprise has an undercurrent of terror. Another Monday, and I'm still sick with a severe flare-up of my chronic illness. Over three weeks now - this is a personal record. I'm trying a program of aggressive rest this week. An oxymoron, yes, but it usually works. Last Monday, I was trying to decide what to read next. I chose This Is Where I Leave You, a novel by Jonathan Tropper. I loved his The Book of Joe a few years ago, and I was not disappointed by his latest novel. An intricate character study of a dysfunctional family brought together by their father's funeral, it was emotional, real, and very, very funny. I've been listening to the teen audio book Hush, Hush by Becca Fitzpatrick. I'm not normally much into supernatural type stuff, but this is very good so far. I'm currently reading the third and final book of The Book of Time trilogy by Guillaume Prevost, The Circle of Gold. My 15-year old son and I both love this time-traveling trilogy, and the final book is so suspenseful that, despite knowing I needed extra sleep, I had trouble setting it down last night! Check out Great Books for Kids and Teens for an update on what my sons are reading this week. Sorry my blog has been so dull again this week. I had another long week spent trapped on the couch, too sick to write anything. Doing a little better today. 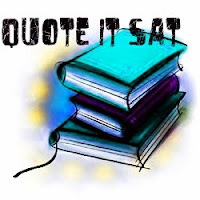 Thanks to That Chick That Reads for starting Quote It Saturday. I looked through my journal of book quotes this morning and found a couple from a favorite Elizabeth Berg novel, The Art of Mending, that I want to share, both dealing with simplifying life (something I could use more of!). There was a cozy completeness to this utilitarian still life. It occurred to me that one of the values of going away was that you saw that something far less complex than what you were used to would do just fine. More and more, I looked at my house, at my life, and thought, "Why do I need all this stuff?" This one reminds me of a favorite Baby Blues comic that my husband and I often laugh about. It shows the Mom and Dad both saying, "I think I'll go to bed now." Then, the Mom starts the dishwasher, folds the laundry, picks up toys, makes lunches for tomorrow, signs school permission slips, washes her face, brushes her teeth, etc. while the Dad goes right to bed and closes his eyes! Perfect, right? I had another week of being sick most days (my chronic illness has been badly flared up lately), so lots of good reading but not much writing time again! I finished After You, a novel by Julie Buxbaum. It was a well-written tale of how a woman copes with the aftermath of her best friend's murder, including taking care of her friend's daughter. I really liked this novel - review to come later this week. I read a wonderful middle-grade/teen mystery, The Mystery of the Third Lucretia, by Susan Runholt, about two young girls who get wrapped up in the midst of an international art crime. I'll post a full review at Great Books for Kids and Teens this week. Last week, I posted two new reviews: Travel Writing , a novel by Peter Ferry, here at Book By Book and Catching Fire, the exciting sequel to The Hunger Games by Suzanne Collins at Great Books for Kids and Teens (though this trilogy is a great choice for grown-ups, too!) 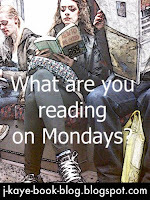 I've also started posting a What Are You Reading Mondays update at Great Books for Kids and Teens, based on what my sons and I are reading, so check it out if you're interested in books for kids, teens, or young adults. Now, comes my favorite part - time to choose a new book to read. I'm not sure what it will be - there are so many great books to choose from! Thanks to That Chick That Reads for starting Quote It Saturday. I skipped last week because I was out of town, so I've been looking forward to posting a new quote this week. I browsed through my journal of book quotes to find something good. I have quite a few quotes written down from Rachel Simon's first memoir, Riding the Bus with My Sister. You might recall that I recently reviewed Simon's latest memoir, Building a Home with My Husband, and included some quotes from that on a previous Quote It Saturday. Her books just seem to speak to me, with all sorts of inspiring tidbits that I want to remember. It might seem hard now...but you have to have bad days to know how to appreciate the good ones. When you listen to somebody's story, and you see the troubles they have, you get a better sense of why they act a certain way. It might not excuse lousy behavior, and not everyone who has a difficult life acts badly. But going deeper, and really listening to someone, can help you see that they don't mean nothing against you, they're just hurting. I love her, and at last I believe she loves me, too, but I know that in her eyes I will always be the big sister. It is both my bridge to her and the moat eternally between us. As soon as I heard about Travel Writing, a first novel by writer Peter Ferry, I was intrigued. I like any novel where the main character is a writer, and in this one, he is a travel writer, something I have dabbled in and aspire to. This unique novel combines elements of mystery and love story, with some travel essays thrown in and a thought provoking overlay on the thin line between fiction and memoir. In short, it defies easy characterization. The narrator is Pete Ferry, a high school English teacher and part-time travel writer whose life sounds remarkably similar to the author’s bio on the back of the book (including sharing the same name), so right away you’re wondering how much of this novel is autobiographical. One night Pete witnesses a traffic accident and sees the beautiful woman driver die. He becomes obsessed with what he witnessed and whether he could have prevented it, and he begins to conduct his own investigation into the woman and the accident. I would go to parties and say I was an editor, and people, especially women – and that was important to me back then – would say, “Oh, really?” and raise their eyebrows and look at me a little more carefully. I remember the first party I went to after I became a teacher, someone asked me what I did for a living, and I said, “Well, I teach high school.” He looked over my shoulder, nodded his head, said, “I went to high school,” and walked away. Once I repeated this anecdote around a big table full of Mexican food in the garden at a place called La Choza in Chicago, and Becky Mueller, another teacher at the school, said that I was a “storyteller.” I liked that. I was looking for something to be other than “just” a teacher, and “storyteller” felt about right. I am a teacher and a storyteller in that order. I have made my living and my real contribution to my community as a teacher, and I have been very lucky to have found that calling, but all through the years I have entertained myself and occasionally other people by telling stories. Ferry creates a wonderful sense of place throughout the novel. Pete lives in Chicago, and the novel contains so many detailed references to the restaurants, bars, parks, and other features of the city that I wished I knew Chicago better so I could fully appreciate every allusion. In addition, the main story of the novel is accented with a series of travel essays written by Pete highlighting Mexico, Thailand, and, my personal favorite, a wilderness canoe trip in Ontario. The travel essays are not separate from the main story but describe Pete’s trips during the timeframe covered in the novel. Travel Writing is the perfect title for this novel because it takes the reader on a journey, through the mystery of the accident, through the places Pete visits, and even through Pete’s own emotional growth. It’s suspenseful and engaging; the characters feel very real. I was kept guessing right until the end about exactly what caused the accident and what Pete would do about it, and I’m still wondering exactly how much of the story was fact and how much was fiction. It’s a fascinating and enjoyable journey. It's Tuesday - Where Are You? Thanks to An Adventure in Reading for this fun weekly feature. I am in the tony Notting Hill section of London with Ellie, a woman from Boston whose life-long best friend was just murdered, as she helps her friend's 8-year old daughter, Sophie, deal with her mother's death and uncovers secrets she never suspected from the woman she's known since she was four years old. The novel is wonderful so far, and I'm enjoying the fictional trip to one of my favorite cities. Hope everyone had a great weekend! Sorry for the lack of reviews last week, but I was very sick all week and unable to do any writing at all. I did manage to post my review of Living Dead Girl at Great Books for Kids and Teens (that one was already written). And I was thrilled and relieved to be well enough by Saturday to enjoy an overnight getaway to the beach with my husband for our 20-year anniversary. I finished Travel Writing by Peter Ferry, a very unique story within a story that provides a mystery, some great travel stories, and a thought-provoking question about the difference between memoir and fiction. Review to come later this week. I read Catching Fire by Suzanne Collins, the long-awaited sequel to The Hunger Games. It was just as compelling as the first book; my husband and I both loved it, and my son was urging me to read faster last week so he can read it! Review to come this week on Great Books for Kids and Teens. I finished the audio book The Crowning Glory of Calla Lily Ponder by Rebecca Wells, even though I never wanted it to end! Review to come as soon as I get a hard copy from the library - I can't write this review without including some excerpts. I started After You by Julie Buxbaum, a novel about how a woman copes with the murder of her best friend. I've only read the first chapter so far, but it sounds intriguing, and I like the writing style.